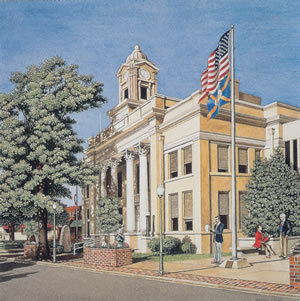 The original Davie County Courthouse, the one built in 1837 in the center of the Mocksville town square, no longer exists. It stood for 85 years before giving way to the road pavers in 1922. The old building had one feature that the newer structure does not have. That feature was a "shotgun" hallway straight through the building from the south to the north. Horseback riders, usually awash in Davie County corn byproducts, seemingly could not resist the temptation and would frequently spur their steeds through the front entrance, down the hall and out the back. If they did the "courthouse gallop" while court was in session, the presiding judge would usually fine the hapless horseman from ten to twenty-five dollars. In at least one instance, a rider, when fined ten dollars, gave the clerk a twenty dollar bill and said he'd just pay for a second ride while he was at it. The present courthouse, as Dempsey Essick has portrayed it, was erected on the southeast comer of the town square in 1909.The building has been in continuous use since that date except for several months in 1916after a fire destroyed the roof and did major damage to the upper floor. A Daniel Boone family marker stands now at the northwest comer of the building, but some old timers might remember when one of R.J. Gatling's first practical machine guns stood on that spot to honor Davie County boys who served in the Spanish American War. It's not likely that anyone still alive remembers the big bell on the roof of the building with the bell rope hanging down into the courtroom so the judge could yank on it to announce that the court was in session. But there may be some who can recall when sawdust was scattered on the floor to accommodate the tobacco chewers who aimed at, but sometimes missed, the spittoons. One veteran of the old time legal wars commented, "What with judges, lawyers, clerks, prisoners and witnesses, all with a wad in their respective cheeks and those big paddle bladed fans on the ceiling stirring up the air, no one is safe from the brown juice crossfire." The architects who designed extensions which were added in 1971 and 1990, were careful not to detract from the Neo-Classical Revival Style of the originalbuilding. The building remains unchanged since being rebuilt after the aforementioned 1916 fire. The building is now listed in the National Register of Historic Places. Identifiable in the picture is a lawyer has paused to wait for Judge Lester Martin, who has stopped to speak to longtime courthouse employee Sharri Campbell. The court room is named in honor of Judge Martin, who is one of the most respected judges in Davie County history. In the background, Postman, Dennis Howell, is entering the building with the day's mail. Dempsey Essick has captured all the dignity and pristine beauty of a building that, for almost a century, has been the dominant landmark of the Davie County seat of government in Mocksville. He has carefully rendered every detail from the dome cupola, with its clock visible from any direction, to the unfluted columns, each standing on a massive base and each topped by a corinthian capital whose decorative acanthus leaves stand in contrast to the strong horizontal and vertical lines of the majestic old courthouse.